What would happen in a war if the troops on one side lounged idle and weaponless at the scene of the battle? What would happen in a football game if everyone - players and fans alike - warmed the stadium seats to watch an empty field? 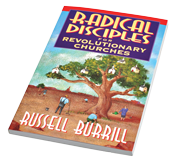 In his earlier book, Revolution in the Church, evangelist Russell Burrill challenged his fellow church members to become participants rather than spectators - to become active rather than passive, and to abandon the lethargic Laodicean lifestyle of relaxing and watching, and get serious about carrying the good news to the world. The ideas you will encounter in this book may indeed be radical. But the author didn't come up with them on a whim. He found them right where you can find them - in the New Testament. Once before, the church applied what you will find in this book, and the result was the explosion of Pentecost. Imagine what will happen when the church rediscovers that secret of power! Imagine Pentecost Two! Softcover, 120 pages.